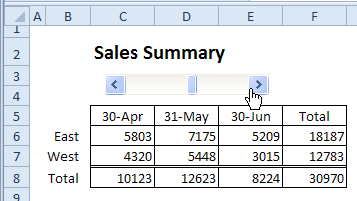 In Excel, you can add a Scroll Bar, and use it to change the values in worksheet cells. In this example, the Scroll Bar will change the end date in a summary report, so you can scroll through the months, and see the data change. This technique does not require any programming. 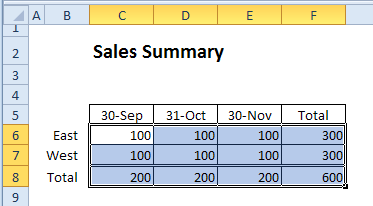 In this example, there is a data table, with sales order information. 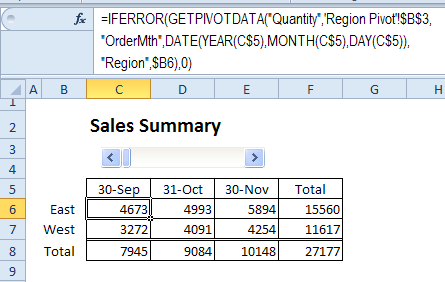 A pivot table is on a separate worksheet, and is based on the sales order table. The order month is in the row area, region is in the column area, and quantity is in the values area. On a separate worksheet, named AdminDates, you'll set up a list of dates, and named cells to calculate which date has been selected in the scroll bar. In column E, enter the numbers 1 to 12, in descending order. 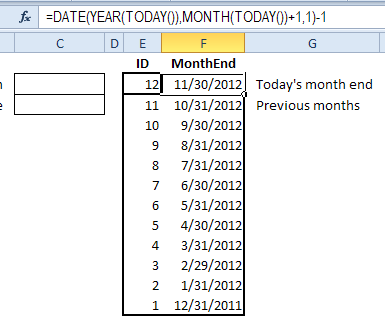 Select cell F3, and copy its formula down to cell F13, to create a list of 12 month end dates. 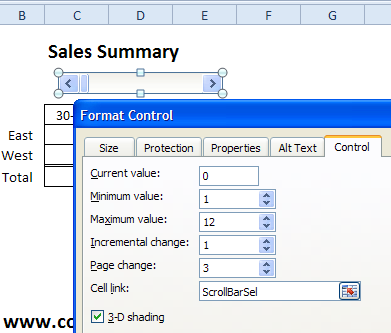 The scroll bar will be linked to a cell, so you'll name a cell on the AdminDates worksheet. On the AdminDates worksheet, in cells B2:C3, enter labels for the scroll bar date cells, and put borders around cells C2:C3. Select cell C2, and name it as ScrollBarSel. In cell C3, enter the following INDEX / MATCH formula, to pull the selected date from the list of dates. This will find the selected number in column E, and return the date from that row. 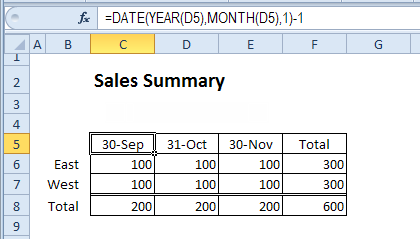 On another sheet, named Summary, set up a table where you can show three months of data, and a total. You'll add formulas in the next step, and for now, just type dates in the heading row, and put fake numbers in the value cells. Add SUM formulas in the Total column and Total row, to calculate the monthly totals and region totals. TIP: After you enter the fake numbers, select cells C6:F8, and click the AutoSum command on the Ribbon, to automatically create the SUM formulas. You can add formulas to the summary table headings, so they show the selected date range. 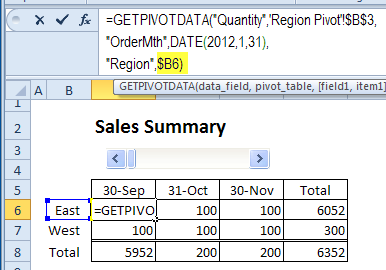 Next, you'll add formulas to the value cells in the summary table, to pull data from the pivot table.. Select cell C6 in the summary table, and type an equal sign. 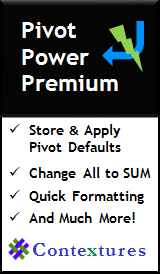 Press Enter, to complete the GETPIVOTDATA formula. I've added line breaks in this example, to make the formula easier to read. 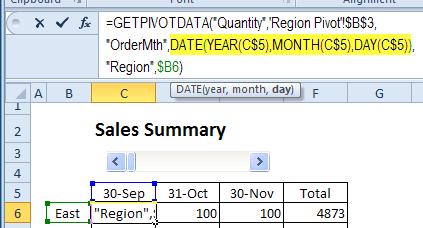 The formula refers to a specific date and region, and you'll change those to cell references. 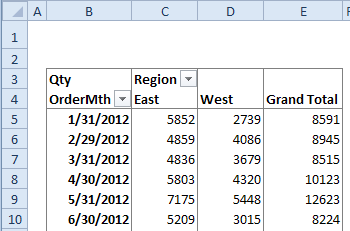 In the formula, select "East", including the quote marks, and click on cell B6, where the East label is. Add a $ in front of the B, to make the column an absolute reference -- $B6. 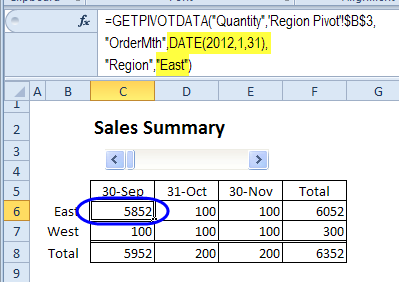 Next, wrap the GETPIVOTDATA formula with an ERRORIF formula, and return a 0 if there is an error. Here is the final formula. Finally, copy the formula across to column E, and down to row 7, to complete the table. The table will show the correct quantity for each month and region. On the Summary sheet, above the date headings, draw a scroll bar. 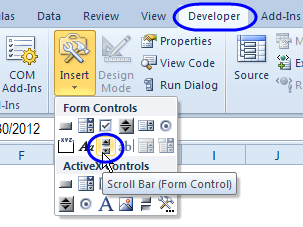 Before you can test the Scroll bar, click on the worksheet, to unselect the Scroll bar. To enhance the report, you can add a chart, based on the three months of data. This video shows how to create the chart, and how to add a worksheet title that shows the selected date range. There are no macros in the file.